Soaking up the view from the 4th tee for the first time is something you won't ever forget. 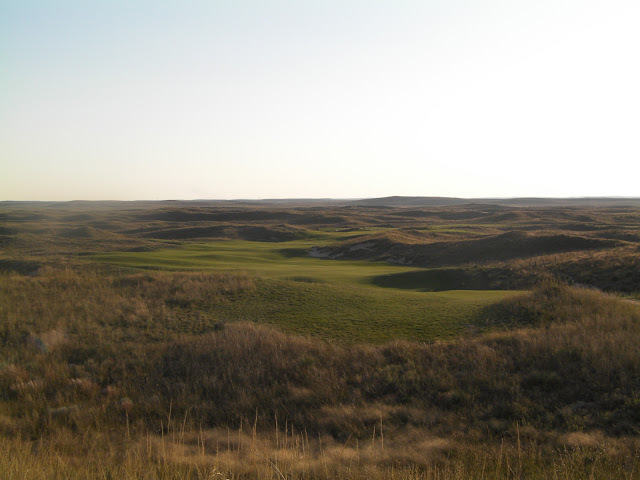 And making that climb up the ridge from the third green to a spectacular view of the Chop Hills never gets old. 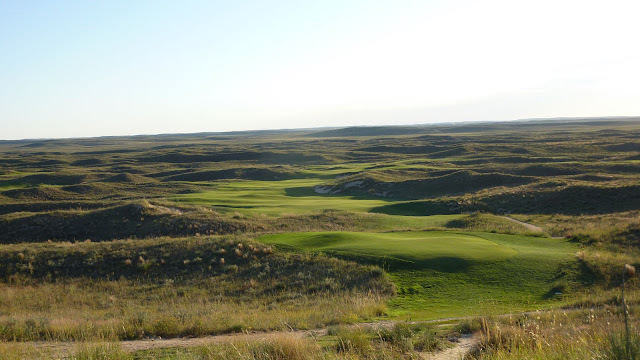 More than just eye candy, the 4th is a fantastic par 5. It's reachable in two with a helping wind. You can really bust one off this elevated tee, so feel free to grip it and rip it. It feels like you can hit it a mile, to the point that the large right bunker looks like it's in play. Unless your Garrett Gordon, the assistant pro, you don't have to worry about reaching it. The left edge of that right bunker is a good aiming point. Anything leaking even a little bit left of center will likely find the left rough or vegetation because of the undulations in the fairway. 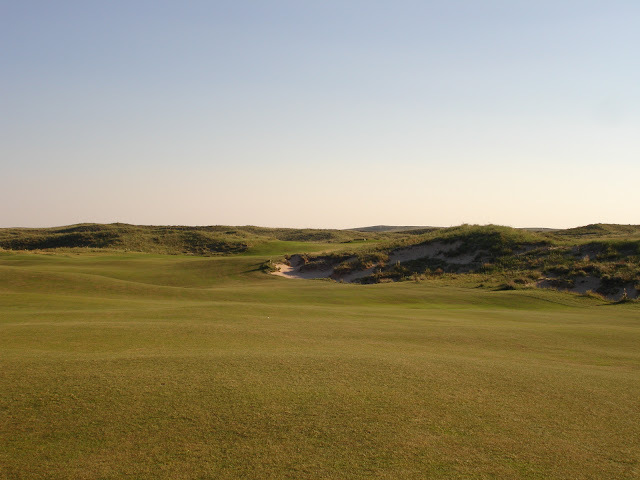 If your drive is outside of 250-260 yards to the front edge, your best bet is to steer well clear of the right bunker and just aim down the left side of the fairway, probably 100 yards back or so. 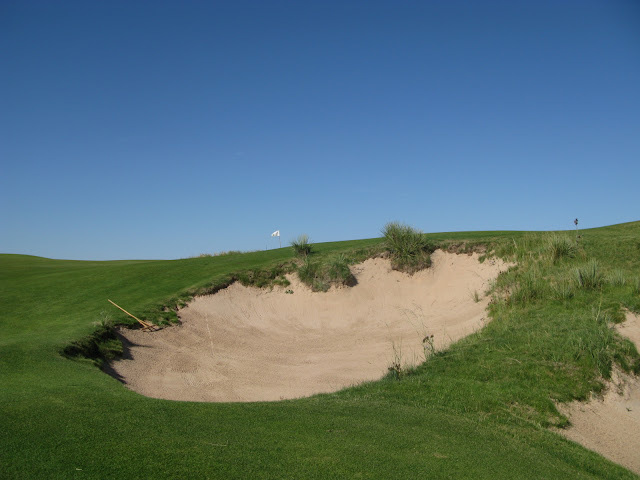 Take it from somebody who has yanked too many 4-irons into that bunker...avoid at all costs. I have the snowmans to prove it. However, if you are within 250 yards, it's worth trying to run one up there. With the firm and fast conditions, the ball will roll forever. Hit a low, running shot starting at the left edge of the green and hope for the best. In between your second and third shots, make sure you walk down the left side of the fairway to check out the pin position on the adjacent 7th green. Stick it in the memory banks as it will be useful information later on. I just love the attention to detail that Doak and Co. built here, giving a preview of what's to come. The term 'false front' will spring to mind, but there's nothing false about the large uphill slope guarding the green. Yes, if you don't chase it up past the first 20% of the green, the ball will likely roll back down to your feet. It also makes putting to a front hole location an interesting challenge. Jefe can attest to this. The picture below shows two things. 1.) the magnitude of the upward slope guarding the green and 2.) the bunker that you need to avoid. I did get up-and-down of this bunker to salvage a halve in my singles match against Jefe, but that's an exception to the rule. 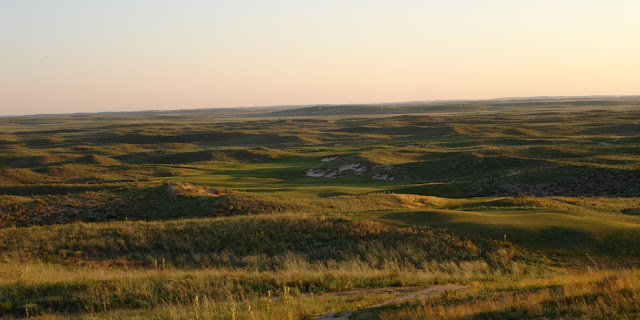 The view from the tee on the fourth hole is one of the great views in golf. When I bring guests there, I have to bite my tongue not to say anything after putting out on three. The distance off the drive is an optical illusion. The hole has great width and provides for a challenging approach shot as the distance is always a little difficult to judge. Visually, probably the best spot on the property. 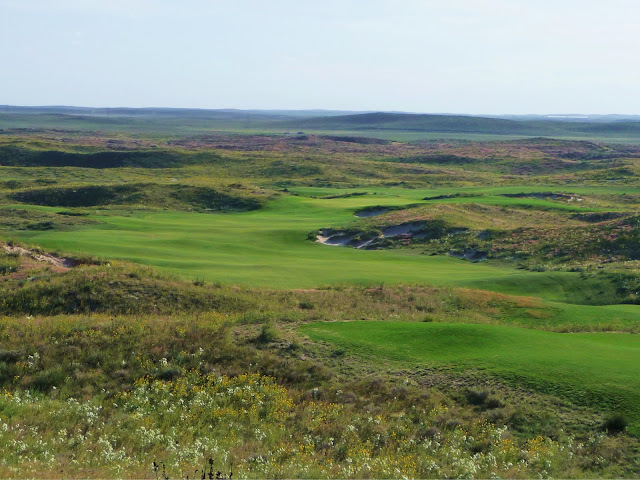 The 4th is a good example of how most of Ballyneal plays. The tee shot is wide open with plenty of room. However, from there, you have options and need to pick the correct line. If laying up, the ball needs to be in the left center of the fairway for the best angle. Leave yourself a yardage where you can put a full swing on the ball and can spin it. 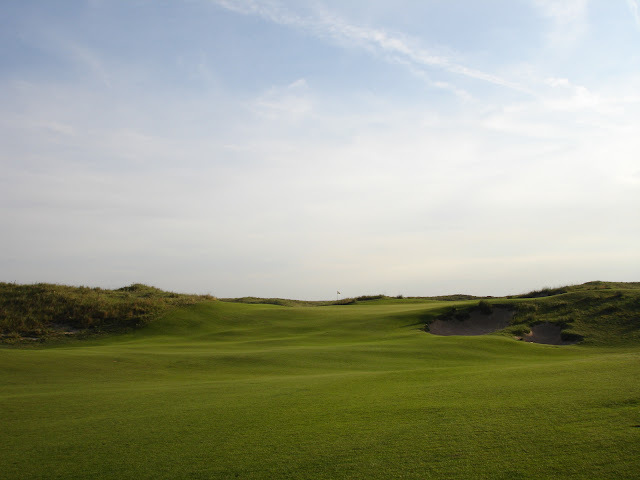 The combination of the false front, slopes, and firm green means many half shots played from 50 or 60 yards will skip through the green to the back bunker. As stated, visually a very cool hole, but it's a ton of fun to play as well. A good drive for a longer hitter can give you the option to go for the green in two, but it's easy to get out of position on this hole near the green due to the elevation of the green. 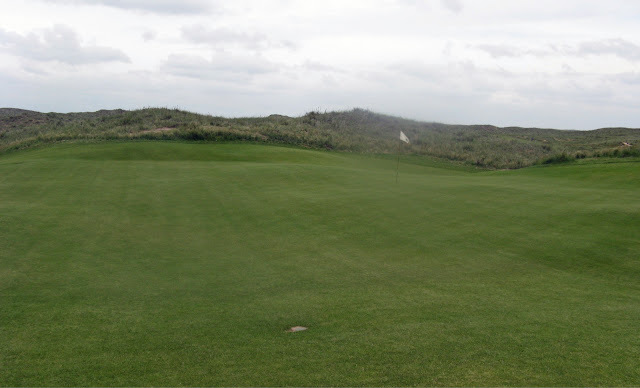 I've putted off the green and down the hill before with the hole cut in the front, putting from the back of the green. This hole is worth I for the view alone but it is also a ton of fun to play. When you are playing bonus holes late at night I think playing the 4th tee to 7th green is a must-do at least once in your lifetime. The walk from the 3rd green to the 4th tee is one of the most breathtaking experiences I have ever had in golf.